Night classes are typically Monday through Thursday nights starting at 6:00 pm. for one week. The concluding weekend is used for checkout dives. Weekend classes are one Friday night and all day Saturday and Sunday for class and pool. The following weekend is used for checkout dives. This is a special class designed to meet the schedule of kids 10 years and older, and also others that have scheduling difficulties. We do not schedule these often. Learn navigation, wreck diving, deep diving, night diving & more! 5 Dives required – Our weekend trip meets this requirement. Trip cost additional. Advanced dive weekend is often done in Jupiter or Pompano Florida. Learn Nitrox! It only takes one night. $150 includes tuition/book kit/and c-card. 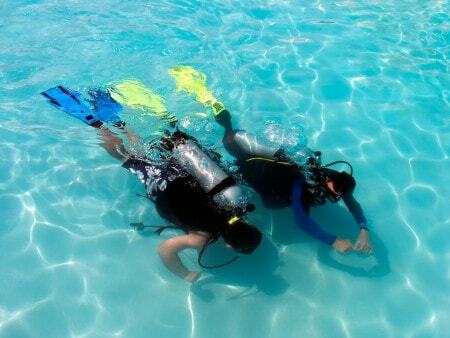 Sign up with us for these specialties, do the book work online and then join us for qualifying dives. $150 each, dive cost additional. Call for Details. We schedule these as we have enough interest, schedule varies. Whether you want to explore deep wrecks, deep spearfishing or just want the knowledge to become a better diver, this course is for you. Check with us for Gear Requirements. Class Schedules – call for class schedule or schedule can be customized for group. This is usually offered as a lecture only, without a certification card. We do spearfishing trips and the certification card for this at an additional cost.